Patients with irritable bowel syndrome (IBS) are often placed on diets guided by food intolerance assays, although these have not been validated. We assessed the effects of individualised diets in patients with IBS guided by a leucocyte activation test. This is a parallel-group, double-blind, randomised controlled trial of 58 adults with IBS seen at an academic health centre in Northeast USA. Peripheral venous blood was analysed using a leucocyte activation test; individual foods were reported to produce positive or negative results. Participants were randomised to a 4-week diet with either individualised guidance to eliminate foods with positive assay results and allow foods with negative assay results (intervention), or with individualised guidance, matched in rigour and complexity, to eliminate foods with negative assay results and allow foods with positive assay results (comparison). The primary outcome was between-group differences in the IBS Global Improvement Scale (GIS). Secondary outcomes included reductions in IBS Symptom Severity Scale (SSS) scores and increases in IBS Adequate Relief (AR) and Quality of Life (QOL) scores. An aptamer-based proteomic analysis was conducted in strong responders. The intervention group had significantly greater increases in mean GIS score after 4 weeks (0.86 vs comparison; 95%CI 0.05 to 1.67; p=0.04) and 8 weeks (1.22 vs comparison; 95%CI 0.22 to 2.22; p=0.02). The intervention group also had significantly greater reductions in mean SSS score at 4 weeks (–61.78 vs comparison; 95%CI –4.43 to –119.14; p=0.04) and 8 weeks (–66.42 vs comparison; 95%CI –5.75 to –127.09; p=0.03). There were no significant differences between intervention and comparison groups in mean AR or QOL scores. A reduction in neutrophil elastase concentration was associated with reduced symptoms. Elimination diets guided by leucocyte activation tests reduced symptoms. These findings could lead to insights into the pathophysiology of IBS. A number of commercially available blood tests claim to diagnose food intolerance,11 and most remain largely unvalidated.12Among the more highly used13 are leucocyte activation tests, which are used to guide elimination diet recommendations, although no rigorous studies of leucocyte activation tests are in Medline-indexed journals. These tests are generally considered unproven diagnostic methods for detecting food allergy.14 In a survey of unconventional medical laboratory tests,13 some respondents noted that leucocyte activation testing is anecdotally reported to be of greater clinical value than other unconventional food intolerance assays. Leucocyte activation tests culture peripheral blood leucocytes with standardised extracts of individual foods, utilising flow cytometry to detect morphological changes in leucocytes after exposure to food extracts, claiming to identify intolerance to the foods. Clinicians use these tests, then make targeted food elimination recommendations. Here, results are reported from a rigorously controlled trial of a leucocyte activation test, adequately powered to assess clinical response in participants with IBS, compared with a matched, individualised, sham diet. The null hypothesis was that that there would be similar responses to either elimination diet (consistent or inconsistent with test results), with no scientific basis to presume differential between-group effects. The study was approved by the Human Investigation Committee of Yale University (New Haven, Connecticut, USA). Data were collected at the Yale Center for Clinical Investigation outpatient facility. All participants provided written informed consent and received financial compensation. The protocol was registered on clinicaltrials.gov prior to enrolment (NCT02186743). intervention—elimination diet consistent with leucocyte activation test results; versus comparison—elimination diet systematically inconsistent with test results, matched in rigour and complexity. Adults 18–75 years of age meeting Rome III criteria for any subtype of IBS15 with active symptoms (SSS ?150) were enrolled. Concurrent IBS medications (eg, fibre, antispasmodics, antidepressants, loperamide, and so on) and behavioural treatments were allowed if dosing was stable for 30 days prior to enrolment. Exclusion criteria included a history of inflammatory bowel disease, abdominal surgeries, radiation proctitis, recent (within 30 days) antibiotic use, and current use of opioids/other analgesics (with the exception of non-steroidal anti-inflammatory drugs), anticoagulants, or immunosuppressives. Also excluded were persons unlikely to make dietary changes, who were operationally defined as eating outside of the home more than five times per week. On enrolment, a single sample of de-identified peripheral venous blood preserved in 3.8 sodium citrate was sent for testing at a commercial laboratory (Alcat Test; Cell Science Systems, Deerfield Beach, Florida, USA) via overnight courier. Leucocytes were separated from whole blood using a density gradient at high-speed centrifugation, and a neutral buffer and autologous plasma were added back to the cells, which were then aliquoted into a round-bottomed test wells or control wells containing 200 test food extracts or neutral buffer, respectively, and then incubated for 15 min, with 100 rpm rotation, at 37°C. Cell counts were performed using the electric sensing zone method (Coulter or impedance method) of particle sizing, distributing each cell into one of 256 size channels, thus creating a size/volume distribution curve, or histogram for each control and each test sample. Differences in morphology curves categorise foods as (1) severe intolerance, (2) moderate intolerance ((1) and (2) denoted as positive in this study), (3) mild intolerance (denoted as mild), or (4) acceptable foods/no reaction ((4) denoted as negative in this study). Intervention: individualised diet consistent with test results. Participants were instructed to avoid positive foods for the diet period (4 weeks). Participants were allowed to consume mild foods every fourth day, and negative foods ad libitum, consistent with usual clinical practice. Dietary instruction was delivered at baseline (in person; 30–45 min) by a blinded registered dietitian, and after 2 weeks (telephone; 15 min). After 4 weeks, participants were instructed to consume an ad libitum diet. Comparison: individualised sham diet systematically inconsistent with test results. Participants were instructed to avoid negative foods for the diet period (4 weeks). Participants were allowed to consume mild foods every fourth day and positive foods ad libitum. Dietary instruction was identical to the intervention group. Participants were assessed at baseline (the day prior to starting the diet), 4 weeks (the final day of the diet), and at 8 weeks postbaseline. 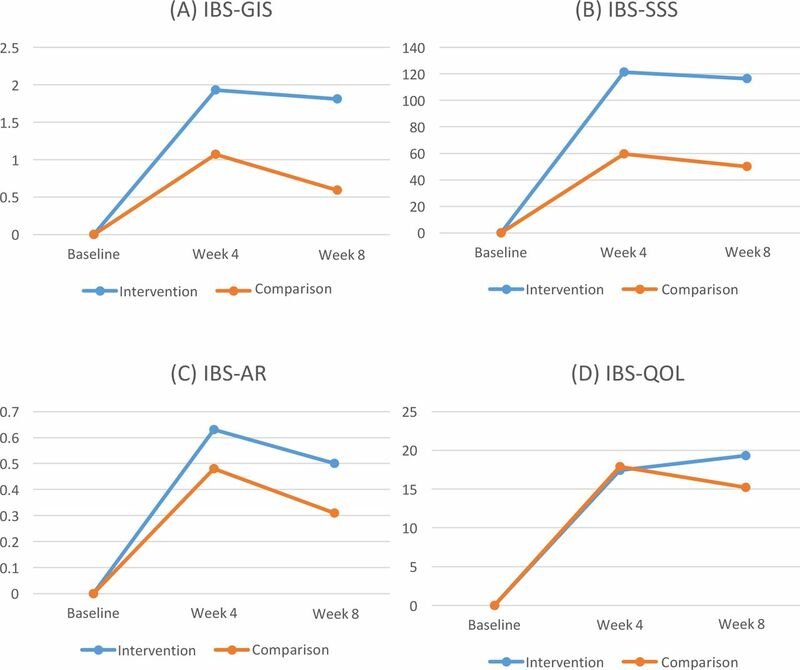 The IBS Global Improvement Scale (GIS) is a validated assessment of IBS symptoms using a 7-point Likert scale ranging from ‘substantially worse’ to ‘substantially improved’ widely used in clinical trials.16 Improvement in the IBS-GIS is associated with satisfactory control of urgency, firmer stools, fewer stools per day, and fewer days with incomplete evacuation compared with non-responders. Participants were queried about the number of times restricted foods were consumed during the course of the 4-week intervention. After initial data analysis, six intervention participants with the highest magnitude of improvement in the SSS (strong responders) were selected for proteomic analysis. Baseline and 4-week plasma samples were sent to SomaLogic (Boulder, Colorado, USA) for analysis of 1128 proteins. Based on results from Kaptchuk and Lembo assessing responses to placebo interventions in IBS,19 an analytic sample of 46 participants was calculated with 80% power to detect a between-group difference of 1.1 points (SD=1.3) on the GIS (two-sided; ?=0.05). Accounting for up to 25% attrition, 29 participants per arm were recruited (total n=58). Participants were randomised in permuted blocks (size of 4) using the OnCore Enterprise Research System (Forte Research Systems, Madison, Wisconsin, USA). Allocation was concealed by restrictions in the software to all blinded study personnel. All participants, investigators, and study personnel (besides the coordinator who assigned dietary interventions) were blinded to allocation status. Participants were assessed individually. Data analysis commenced after all study assessments were complete and the database locked. On enrolment, blood was drawn for eligibility screening and leucocyte activation testing. Test results were electronically transmitted to the coordinator (TRW), and eligible participants were then scheduled for dietary instruction. Prior to the dietitian visit, the coordinator electronically sent the dietitian each participant’s list of positive, mild, and negative foods. In order to create a sham diet control, a standardised food substitution list was developed prior to enrolment. Substitute foods were matched by type (fruits, vegetables, legumes, grains, spices, and so on) and ubiquity (common/uncommon foods). Second-choice, third-choice, fourth-choice, and fifth-choice foods were noted in the substitution list to account for instances where preceding foods were restricted. Substitution choices were limited to the 200 items in the test food bank (see online supplementary appendix 1 for the food substitution list). For participants randomised to the comparison diet, the food substitution list was used to develop an elimination diet that matched the rigour (ie, number of foods to eliminate) and complexity (range of foods) as the ‘true’ test results. Thus, the list of foods designated as positive or mild to the dietitian was actually foods from the negative list in the participants’ test results. The dietitians counselled all participants in the same manner without knowledge of true test results. Thus, each participant received an individualised elimination diet either consistent with (intervention) or systematically inconsistent with (comparison) test results. Analyses were conducted using Stata V.14.1. Individual changes between baseline and week 4 were computed for each outcome and tested for whether the mean change observed in the intervention and comparison groups differed significantly (?=0.05) using independent t-tests. Distributions of change across time were tested for equality between the intervention and comparison groups using Wilcoxon rank-sum tests. The t-tests have more statistical power, while the Wilcoxon rank-sum tests are more robust to non-normality of the underlying distributions. Effect sizes (Cohen’s D) were calculated as the mean difference in changes across time between groups divided by the pooled SD of changes across time. The same analyses were performed for changes between baseline and week 8. Analyses followed the intention-to-treat principle. Proteomic data were analysed by paired t-tests (?=0.05). To account for multiple comparisons, a Benjamini-Hochberg correction with a false detection rate at 0.3 and significance threshold at 0.05 was applied. After study completion and locking the database, all authors had access to the study data and had reviewed and approved the final manuscript. Participants were recruited from Connecticut from primary care and specialty practices, newsletter announcements, flyer postings, and electronic media, including clinicaltrials.gov and university (yalestudies.org) sites. Of 126 volunteers screened, 68 were not eligible or declined to participate. Fifty-eight participants were randomised between July 2014 and November 2015. One participant, randomised to intervention, declined to participate as new employment resulted in a lack of time to participate. Two other participants (randomised to intervention) left due to participant burden (one prior to week 4 and one between weeks 4 and 8). All 29 participants in the comparison group completed the study. Thus, 56 participants (97%) remained for the week 4 analysis and 55 participants (95%) remained for the week 8 analysis. The final follow-up visit (8 weeks) occurred in January 2016. The trial ended once the predetermined sample size (58) was achieved. There were no missing data (see figure 1). Baseline characteristics are in table 1 showing no significant between-group differences. Table 2 notes the most frequently restricted foods. Participants were restricted from a mean of 13 foods (SD=6), out of 200 possible test foods. During the 4-week dietary period, participants consumed restricted foods at a mean of 2.46 (SD=4) times. Overall rates of adherence are statistically indistinguishable (p=0.26) between intervention and comparison groups. Seven participants consumed restricted foods more than four times, and three participants consumed restricted foods more than eight times. All values are mean±SD, unless otherwise noted. Baseline differences in means were assessed with t-tests for quality of life, SSS and body mass index, while differences in distributions of GIS were determined by Wilcoxon rank-sum testing. IBS, irritable bowel syndrome; IBS-C, IBS with constipation; IBS-D, IBS with diarrhoea; IBS-M, mixed IBS; IBS-U, unsubtyped IBS. FODMAP, fermentable, oligosaccharides, disaccharides, monosaccharides, and polyols. The intervention diet resulted in a statistically significant change over time in GIS between the intervention (n=27) and comparison (n=29) diet at 4 weeks with a mean between-group difference equal to 0.86 (p=0.04, 95% CI 0.05 to 1.67). The significant improvement in the GIS in the intervention group persisted at 8 weeks with the mean between-group difference equal to 1.22 (p=0.02, 95% CI 0.22 to 2.22) (see table 3 and figure 2). Change from baseline in global improvement, symptom severity, adequate relief, and quality of life. IBS-GIS indicates the Irritable Bowel Syndrome Global Improvement Scale; IBS-SSS, Irritable Bowel Syndrome Symptom Severity Scale; IBS-AR, Irritable Bowel Syndrome Adequate Relief; and IBS-QOL, Irritable Bowel Syndrome Quality of Life Questionnaire. Values are expressed as mean change. Positive scores denote improvement. The intervention group demonstrated significantly larger between-group improvement than the comparison group in the (A) GIS at 4 weeks (1.93 vs 1.07; ES 0.55, p=0.04; n=56—primary endpoint) and 8 weeks postbaseline (1.81 vs 0.59; ES 0.63, p=0.02; n=55), and (B) SSS at 4 weeks (121.4 vs 59.6; ES 0.56, p=0.04) and 8 weeks (116.4 vs 50.0; Effect Size (Cohen’s D) (ES) 0.57, p=0.03) postbaseline. No significant between-group differences were seen in the (C) AR and (D) QOL scales. Relative to baseline, all outcomes improved in both groups at 4 weeks and 8 weeks. All values are means ±SD, unless otherwise noted. Changes between baseline and the week 4/week 8 time points were computed for all outcomes and tested for whether the mean change observed in the intervention and comparison groups was significantly different (?=0.05) for each measure using independent t-tests. The distributions of changes across time were also tested for equality in the intervention and comparison groups using Wilcoxon rank-sum tests. *p Values are from independent t-tests and Wilcoxon rank-sum tests. AR, IBS Adequate Relief Scale; GIS, IBS Global Improvement Scale; IBS, irritable bowel syndrome; QOL, IBS Quality of Life Questionnaire; SSS, IBS Symptom Severity Scale. Both the intervention and comparison groups demonstrated significant improvements from baseline in SSS, with the intervention group experiencing significantly larger improvements. The mean between-group difference in change since baseline at 4 weeks was –61.78 (p=0.04, 95% CI –4.43 to –119.14), and the mean between-group difference in change since baseline at 8 weeks was –66.42 (p=0.03, 95% CI –5.75 to –127.09) (see table 3 and figure 2). There were no statistically significant between-group differences in the change over time for IBS-AR and IBS-QOL at 4 weeks or 8 weeks (see table 3 and figure 2). No adverse effects related to the intervention were reported. Two instances of syncope related to blood draw occurred. 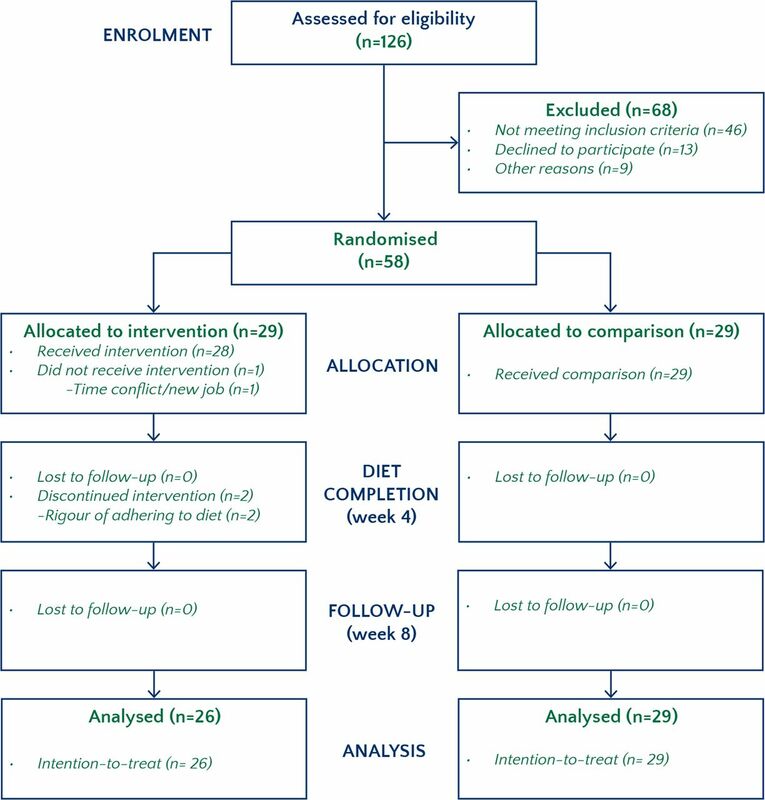 To assess whether dietary adherence affected outcomes, the sample was divided into higher adherence (eating restricted foods two or fewer times) and lower adherence (eating restricted foods three or more times) over the course of the 4-week intervention period, resulting in an approximately 50–50 distribution (median-split analysis). No significant differences were found between the adherence subsamples and the full sample. The original study dietitian (AS) had a leave of absence during the course of the study (after 35 participants), and was replaced by a second dietitian (SK). Effects were estimated separately for participants counselled by each dietitian. No significant differences between dietitians were found. To account for potential bias induced by non-random attrition, effects of the treatment were re-estimated on the entire baseline sample under the assumption that those who discontinued treatment would have experienced zero effect of the treatment. One individual dropped out of the study before week 4, and two dropped out before week 8. Between-group differences in GIS and SSS remained statistically significant. As placebo effects have been shown to increase with more invasive interventions,26 27 we assessed the effects of the number of restricted foods versus change in the IBS-SSS (our continuous measure). No association was found between the number of restricted foods and change in IBS-SSS scores in both the intervention group (p=0.70) and in the control group (p=0.82). In paired analysis of the 12 plasma samples, concentrations of 87 of the 1128 proteins were significantly different (p<0.05) between baseline and week 4 samples. To correct for multiple comparisons, these data were analysed with a Benjamini-Hochberg procedure.28 After this correction, a significant pre–post difference in a single protein (neutrophil elastase) was found to be reduced in strong responders. In this study, statistically significant benefits were seen in the primary outcome of global improvement, as well as in symptom severity in a 4-week diet guided by leucocyte activation testing compared with a matched sham diet29 in an adequately powered sample of 58 participants with IBS. While quality of life and adequate relief both improved, statistically significant between-group differences were not seen. Both groups demonstrated significant improvements from baseline. Thus, a substantial intervention effect and a substantial placebo effect were seen, with the intervention effect significantly better than placebo in global improvement and symptom severity, with effect sizes30 of medium magnitude. Furthermore, between-group differences in global improvement and symptom severity remained statistically significant at 8 weeks postbaseline (4 weeks after the dietary intervention), as participants noted adhering to aspects of the elimination diet (during the ad libitum phase between weeks 4 and 8) consistent with achieving symptomatic relief. These findings reject the null hypothesis and show that a diet guided by leucocyte activation testing results in demonstrable clinical improvement in IBS. These clinical results, associated with a reduction in plasma neutrophil elastase, have implications for better understanding the role of food intolerance and the pathophysiology of IBS. While the prior literature assessing specific elimination diets for IBS has shown conflicting results,4 43 a dietary pattern restricting fermentable oligosaccharides, disaccharides, monosaccharides, and polyols (FODMAPs) has shown promise as an efficacious, although burdensome, dietary intervention for IBS.4 44 Indeed, the magnitude of improvement in SSS scores (mean 121 points in intervention participants, 60 points in comparison participants) compares favourably with participants consuming a low-FODMAP diet (mean change of 78 points) in a recent randomised trial.45 In contrast to the broad restrictions imposed by the low-FODMAP diet, this study finds significant effects from individualised diets based on results from a leucocyte activation test. As seen in table 2, there was infrequent overlap between test-positive foods and high-FODMAP foods,46 as well as no significant differences in the frequency of restriction of high-FODMAP foods between intervention and control groups. Future studies can directly assess clinical response based on leucocyte activation testing compared with low-FODMAP diets. This finding is of interest as elastase is widely distributed in innate immune cells, including in neutrophils and mast cells. Mast cells are of particular interest as they have been shown to be increased in close approximation to nerves in the colonic mucosa.49 50Mast cell mediators such as tryptase and histamine are increased in the colon of patients with IBS.49 Elastase can cause tissue damage and also disrupt tight junctions, which may increase intestinal permeability.51 The validity of the clinical results is not dependent on the proteomic data, which may however provide mechanistic insights. Future studies can investigate mechanistic factors in greater detail. It is noteworthy that participants consuming a sham diet improved from baseline. Non-specific, contextual, and placebo responses tend to be high in IBS.35 53 54 Indeed, Kaptchuk and Lembo demonstrated the utility of open-label placebos in IBS.19 Placebo interventions involving a therapeutic ritual, such as an elaborate dietary change, may affect subjective symptomatology to a greater extent versus simple placebos, such as pills.26 27 It is also possible that comparison group outcomes reflect a combination of beneficial placebo combined with deleterious effects of consuming presumably intolerant foods in the elimination diet. Nevertheless, between-group differences in the GIS and SSS were approximately double in the intervention group compared with the comparison group. Furthermore, we found no evidence to indicate that the rigour of the intervention (number of restricted foods) was associated with greater improvements. In summary, this study provides data suggesting that a leucocyte activation test can be used to develop an individualised diet that can alleviate symptom burden in IBS. These dietary changes may be less restrictive than a low-FODMAP diet, and may result in better long-term adherence. Future studies, ideally multisite and in larger samples, can assess comparative effects of other dietary interventions in IBS, the effects of restricting specific foods, and whether dietary changes guided by leucocyte activation testing affect other conditions. We thank Eugene D Shapiro MD, Gowri Ananthanarayanan MS, David Brady ND DC, Evangelos Dioletis PhD, Changchuan (Charles) Jiang MD MPH, Irma Garcia Martinez PhD, Seth M Luty MS, Kristin DeFrancesco BS, Nicholas Licht MBA, Theresa Katz, and Julia O’Sullivan ND MS for their technical support and assistance, and extend special thanks to Yvette Strong and Irene Matos RN for their kind care and laboratory assistance during participant visits. We are especially grateful to our study participants. Contributors AA designed the study, drafted the manuscript, obtained funding, interpreted the data and was responsible for overall supervision of the study. He has full access to all the data in the study, but was blinded until study completion. TRW was involved with the acquisition of data, critical revision of the manuscript for important intellectual content, administrative support and supervision of the clinical staff. DM conducted and is responsible for the data analysis, statistical analysis and critical revision of the manuscript for important intellectual content. AS and SK were involved with the acquisition of the data. MRF was involved with data analysis and critical revision of the manuscript. DA was involved with the design of the study. WZM was involved with the conception and design of the study, statistical analysis, interpretation of the data and critical revision of the manuscript for important intellectual content. WZM and AA take responsibility for the integrity of the data and the accuracy of the data analysis. Funding This study was funded by Cell Science Systems, Corp. (Deerfield Beach, FL). The sponsor had no role in the design and conduct of the study; collection, management, analysis, and interpretation of the data; and preparation, review, or approval of the manuscript; and decision to submit the manuscript for publication. This publication used resources from CTSA Grant Number UL1 TR000142 from the National Center for Advancing Translational Science (NCATS), a component of the National Institutes of Health (NIH). Its contents are solely the responsibility of the authors and do not necessarily represent the official view of NIH. Ethics approval Human Investigation Committee of Yale University. Data sharing statement Individual participant data that underlie the results reported in this article, after de-identification (text, tables, figures and appendices), and/or the study protocol will be shared beginning 9 months and ending 36 months after article publication. Data will be shared with investigators whose proposed use of the data has been approved by an independent review committee (‘learned intermediary’) identified for these purposes: (1) for individual participant data meta-analysis, and (2) researchers who provide a methodologically sound proposal. Proposals should be directed to ather.ali@yale.edu. To gain access, data requestors will need to sign a data access agreement.